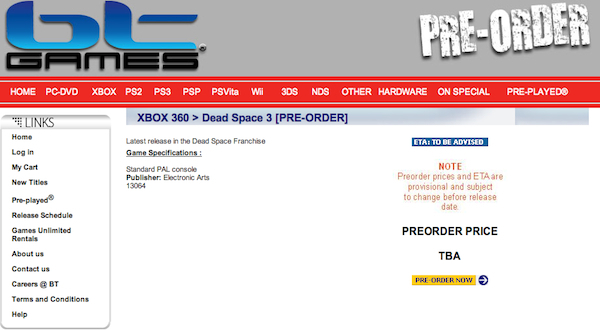 With rumors circulating throughout the Dead Space community concerning the premise for the possible upcoming Dead Space 3 installment having no expiry in sight, it would seem to be an exhale of excitement for many Dead Space fans to see retailer BT Games accidentally leak the possible game on their website. Albeit there being no official announcement from EA Games, BT Games insists the game is in fact deep in its developmental cycle and it will be hitting store shelves in times soon to come. Below is the supposed leak by the gaming retailer. Aside from the image being a sort of hand having tangent quality in touching the hearts of die hard Dead Space fans in a sort of fashion that positively riles them up, the leak may actually be a marketing attempt to publicize the game prior to its announcement. Nevertheless, with the rumors that have been making their way around the many tangles of the Internet, Dead Space 3's alleged premise will take place on an icy planet named Tau Volantis. After crashing landing on the planet, and believing all of its inhabitants are dead, Isaac Clark travels to a nearby outpost to find Ellie who was an original survivor in Dead Space. Ellie, surprised and shocked, informs Isaac about the existence of other outposts and the groups of people who trekked to them. Not long after does the brave Issac gear up and courageously walks into the unknown.